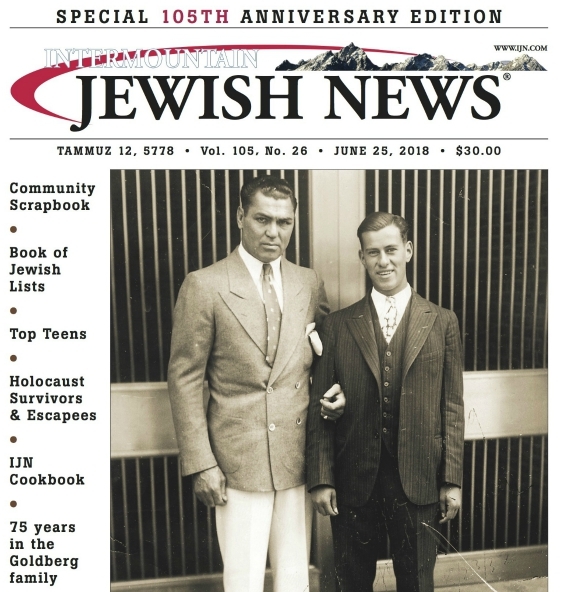 The Intermountain Jewish News is marking 105 years of continuous publication, every Friday, with a 162-page large-size, commemorative 105th anniversary magazine, scheduled for mail delivery to subscribers, Monday, June 25, 2018. The magazine is also available to order. The souvenir magazine focuses on the people who have led, built and characterized the Rocky Mountain West over the past 105 years. The magazine also looks at the history of the world through the eyes of the newspaper’s writers since the early 20th century. Other sections of the magazine include a comprehensive list of Holocaust survivors and escapees, an “IJN Cookbook,” “Top Teens,” a Book of Jewish Lists and a tribute to Max and Miriam Goldberg, the late publisher and editor of the newspaper, whose family has owned and published the IJN for 75 years since 1943. The IJN is a much-awarded weekly newspaper which began publication in 1913 under the auspices of a synagogue, BMH congregation. Two years later, the paper was taken over by the Central Jewish Council, a community philanthropic organization. After struggling through — and surviving — the Great Depression of the 1930s, the Central Jewish Council transferred ownership of the IJN in 1943 to Max Goldberg for $1. Goldberg was a “media personality” and political consultant. Goldberg took in CU’s outstanding journalism graduate, Robert S. Gamzey, as editor. The duo grew the newspaper in all aspects: news and feature coverage, advertising revenue and circulation. The IJN rose to national prominence as a pioneer member of the American Jewish Press Association. Gamzey retired as editor and moved to Israel in 1966, where he became the first fill-time Israel correspondent for an American Jewish newspaper. Goldberg continued as editor and publisher until his death in 1972. His widow Miriam Harris Goldberg stepped in as editor and publisher and fortified the newspaper both as a news medium and as a business. Miriam Goldberg embraced the technology of the time, utilizing Telex to receive new stories from the IJN’s Israel and Washington bureaus, which she established. She introduced the special issue, which has been an IJN trademark, evolving into 18 themed pull-out sections and three magazines a year. The IJN also produces commemorative sections and magazines for special events such as national conventions and community organization milestones. Miriam Goldberg passed away in 2017 at age 100. Max and Miriam Goldberg’s son Rabbi Hillel Goldberg, PhD, began writing for the newspaper as a college student in 1966. He served as the Jerusalem correspondent for 10 years until he returned to Denver in 1983. He is now the executive editor and oversees all operations of the IJN. Under his leadership, the IJN moved into the digital age, in-house pre-press production and digital delivery and promotion of the newspaper via website, e-newsletter, social media and mobile devices. Shana Goldberg, a granddaughter of Max and Miriam Goldberg, is assistant publisher, supervising all digital content, and another granddaughter Tehilla Goldberg, writes an award-winning weekly column. TheIJN is produced by long-serving staff members: Rabbi Goldberg, 52 years; Associate Editor Larry Hankin, 42 years; Assistant Editor Chris Leppek, 40 years; Sports Editor Gerald Mellman, 40 years; Production Manager Seiji Nagata, 33 years; Account Executive Lori Aron, 27 years; Senior Writer Andrea Jacobs, 25 years. Others with long tenures are Bookkeeper Dave Fetscher, 20 years; Receptionist and Circulation Manager Carol Coen, 13 years, and high school interns. The IJN and its staffers are multiple winners of the national Rockower Awards for Excellence in Jewish Journalism, and awards from the Colorado Press Association, National Press Women and Colorado Press Women. The IJN has been headquartered in the Capitol Hill neighborhood of Denver for 53 years. It covers the Jewish communities throughout the Rocky Mountain West, including those in Boulder, northern and southern Colorado, the mountain resort communities; Wyoming, Montana, Utah and northern New Mexico. The IJN is the finest weekly. Jewish publication ever. It is so balanced and reliable in all subjects. I read it from cover to cover every week. It comes to us as a Chanukah gift from our Denver Family.